I took a detour home from work tonight and stopped in for a brew and a catch up with an old friend and his wife. After celebrating their wonderful news, the conversation moved to the outdoors, projects, spreadsheets and all that goes in between. Driving home I felt a renewed vigour for ’15 for 15′, the project myself and Riggers hatched back in October in the snug of the Britons Protection. As with all good plans it began over a pint of Amstel and a conversation about our mutual love of taking to the hills for the day. We both acknowledged that we’d not done enough walking in 2014, in fact, with the exception of two failed attempts at scaling peaks, I’d done very little. Clinging to the side of Ben Scurragh and refusing to go any higher because of the wind would not tick any self respecting peak-baggers box. We both like a project, in fact I thrive on them, and like nothing better than making lists, ticking things off, and then boring everyone senseless talking about it. Remember the marathon? So we made a list. Nothing restrictively ambitious, just 15 lovely walks across the UK to be completed during 2015. Mr P would complete the trio, and we would use our challenge to invite like-minded friends to join us in the hills and have a jolly wholesome time. As you can see by the fact that we thought Kinder Scout was called Tinder Scout, and the whole challenge would be sponsored by Amstel, we had surpassed the amount of Amstel that you should drink on a school night whilst making life plans. 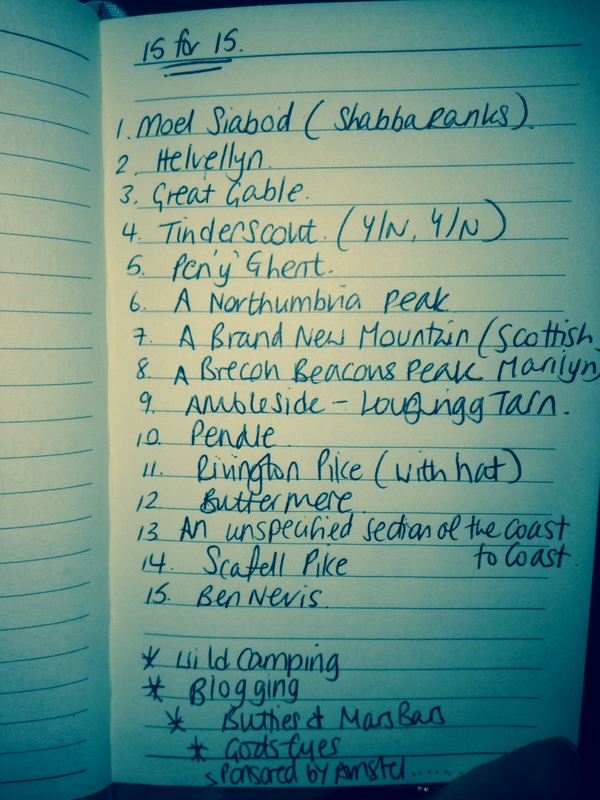 It should be noted that this is the first draft of the list, the second involved doing the Three Peaks in 24 hours. By this point we were disrupting the snug and were on the verge of inviting them all to join us on our travels. It was cold, there was a fire, what can I say…we got carried away with the festivities. And so that was that. We woke up, went to work (slightly less enthused), and after a few weeks all but forgot about it. Christmas took over and before I knew it January began in it’s usual hazy way, all plans to start the year with a brisk jaunt up Pendle sidestepped due to the post New Year dull aching head. So what happened next? Well, I can happily say we have since completed one of the 15 walks, twice. Nicky has completed a second walk (three if you include walking to see a Gruffalo). We’ve gained companions, had offers of accommodation, cancelled one walk due to snow and illness, and already had to write off February as a trio because we’re all booked up three months in advance. I’ve also been virtually introduced to ‘The Taxi Driver’, a hiker from Yorkshire who has a prolific You Tube following due to his walks with a handheld video camera and steady informative monologue. I’ve got to admit it’s the accent that does it for me rather than the routes, but nevertheless he’s proved invaluable during my initial research. As we’re perilously near to the end of February I’m well aware that my write up of this challenge is seriously lagging, so I’ll share walk number 1 in my next blog. All I’ll say for now is that I first went up Pendle in 1990, and the fact that the challenge began walking up it in the worst weather conditions I’ve ever known gives me a real sense of foreboding. Still, it’s all in the name of a good spreadsheet, and I can certainly cope with a bit of adverse weather for that. This entry was posted in Walking and tagged Amstel, Ben Scurragh, Brecon Beacons, Britons Protection, Buttermere, Cotswolds, Great Gable, Helvellyn, hill walking, Kinder Scout, Loughrigg Tarn, Moel Siabod, Northumbria, Pen y ghent, Pendle Hill, Rivington Pike, Scafell Pike. Bookmark the permalink. Looking forward to hearing how you get on and happy to jump on board on your way up Tinder…sorry, Kinder.